Change is never easy, especially big changes you didn’t choose for yourself that have no real bright side. Changes like you or your spouse being told that your job is being eliminated. It’s not something you ever want to hear, but it’s even harder when it’s unexpected. When you thought the position was solid and stable. When you had almost 20 years there, so you actually had a few weeks of vacation and some sick-leave when the kids are ill. When you relied on it for the family’s healthcare. See, here’s the thing. There is no safety net unless you make one yourself. Unemployment benefits are meager and last six months. There’s no healthcare included, and our other employer’s health insurance is the very minimum required for them to not pay fines. We’ve been blessed by good fortune and made good choices, so we’ve been able to set-up our life so we can “make-it” without dipping into savings on just one of our salaries. And that same good fortune and good choices have made it possible for us to have savings. Yes, there will be some belt-tightening, and I’ll be putting off that purchase of a new computer. But we’ll be okay. Our kids will be okay. The biggest thing we’re facing is if anyone gets hurt or sick. But we’ll figure that out if it happens. 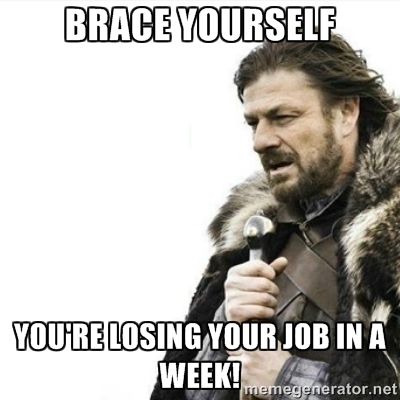 And, of course, it’ll mean starting all over and having little-to-no paid time off. Still, here’s hoping a new position is found quickly. In the meantime, writing, editing and blogging might become more sporadic, especially as we work through all changes needed in our day-to-day endeavors. I need time to cope, process and plan. I couldn’t even look at the screen after learning the news. I did, however, escape into a book or three. Ah, escapism! Very sorry to hear this. Good luck to him on finding something new quickly. Best of luck. Sending warm thoughts. I am so sorry to hear this. I truly understand the shock, anxiety, hurt, and pain this can cause. I was fired via an email on 25 Nov 15 (Thanksgiving eve) from a place I had worked 15 years. The feelings can’t be shared but they can be understood. I pray you find a new position soon. That’s awful! You pulled through, though. What doesn’t kill you makes you stronger?